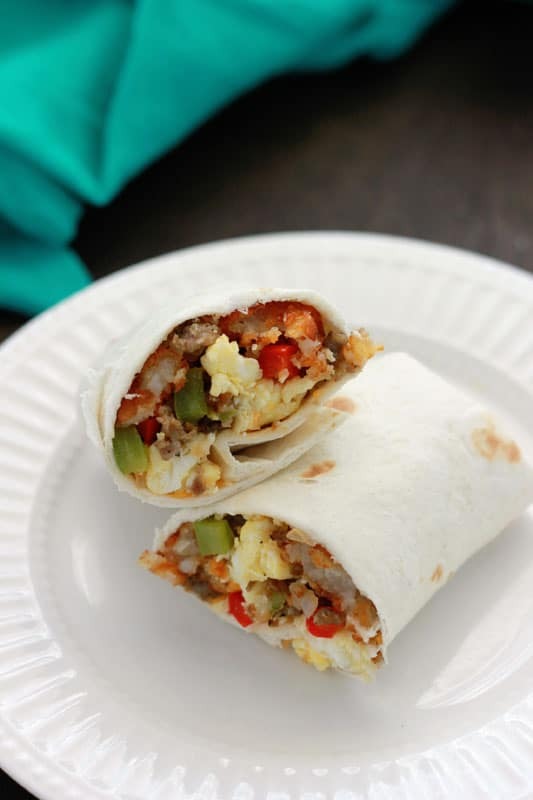 TWO things you should know about this easy Breakfast Burrito recipe… It is freezer friendly AND perfect the perfect camping recipe! If you ever come visit the One Sweet Appetite family you will most likely see a shelf full of these in our freezer. There is not anything better than having a warm breakfast ready in just minutes on busy mornings. I have been guilty of hitting the snooze button one or two (or ten) times. It is comforting to know I can fill my little guys belly with something besides cereal before he heads off to school. We try to mix things up and experiment with different flavor combinations (my picky eater prefers only eggs, bacon, and cheese) which means there are always multiple options to pick from when you are starving and in need of a belly filler but this version is by far our favorite. 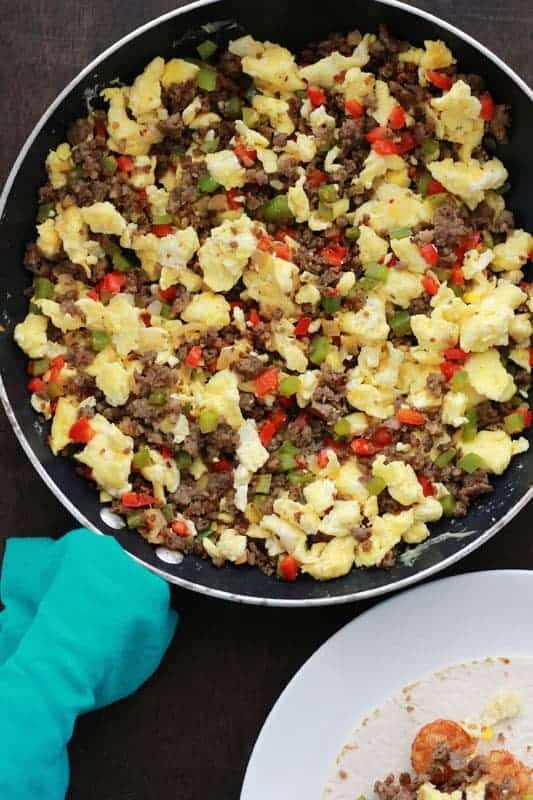 Packed with eggs, sausage, peppers, cheese, and hash browns you are sure to be satisfied! Follow the recipe all the way through folding your filled burritos. Place closely on a parchment lined baking tray. Flash freeze for 20 minutes. Individually wrap each one in plastic wrap and place in a labeled zip top bag. When you are ready to eat simply unwrap and discard the plastic wrap, wrap in a moistened paper towel, and heat in the microwave for 1 to 2 minutes. Let’s talk about taking these things CAMPING. Whenever we get together with big groups I always opt to take breakfast. You make these in advance so you have ZERO prep work when you get there and ZERO clean up. They are wrapped in foil so all you need to do is toss them on warm coals, a grill, or in the oven to heat through. You are a rock star for giving everyone a delicious meal. Bonus? Everyone will be extremely jealous of how little work your meal was compared to theirs! Individually wrap each one in FOIL. Pack in a cooler for your trip. When you are ready to eat simply place on a grill or warmed coals. Turn once or twice and check about 15 minutes to see if they are warmed through. What can you put in breakfast burritos? Like this recipe? 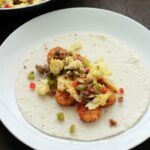 You will love my Spicy Deviled Eggs, Sweet Potato Breakfast Hash, and Huevos Rancheros Casserole! TWO things you should know about this easy Breakfast Burrito recipe... It is freezer friendly AND perfect the perfect camping recipe! Cook your breakfast sausage in a large pan. Drain grease and set aside. Using the same pan combine the peppers, onion, and olive oil. Saute the vegetables until soft and onions are translucent. Combine with the sausage. Whisk the eggs with the sour cream in a large bowl. Season with salt and pepper to taste. Cook until fluffy. Stir into your sausage mix along with the hash browns and cheese. Wrap a heaping half cup of the egg mixture into each tortilla folding burrito style. * We like sharp cheddar or pepper jack but you can use any type of cheese you prefer. * We've used every type of frozen potato and love them all. Just choose your favorite and make sure it's cooked fully before you add them to the burrito *Freeze the burritos before taking camping. It keeps them cool until you are ready to use. TO FREEZE: Place foil or parchment on a large baking sheet. Build all of your burritos and fold tightly aligning as close as possible without having them touch on your prepared pan. Place in the freezer for 20 minutes. Remove and wrap each burrito individually in plastic wrap. Store in a large Ziploc. When ready to eat remove from the plastic, wrap in a damp paper towel, and microwave 2 minutes. FOR CAMPING: Follow the freezer instructions substituting foil for plastic wrap. When ready to eat place the foil wrapped burritos on hot coals until heated through. Just fixed the post! The sour cream is whisked into your eggs. It makes them super fluffy. Thanks for the good ideas. I want to try different things on this years camping trips. We just went with our grown kids and grandkids and breakfast turned into a big production. Your ideas are alot simpler and easier to clean up! Karen, You’ll have to come back all week. We’ve got a bunch of easy meals that I will be posting! I found a really quick and good way to do breakfast burritos. I scramble some egg beaters in a small pan (can add sausage scrambles if needed), throw a tortilla on a foil pan on the grill, sprinkle some grated cheese. Add spinach & cilantro, add the cooked egg, some pico de gallo and some salsa verde. Roll up – awesome!!!!! Even the boyfriend loves it! Oh my gosh I’m so glad I found this on Pinterest! I’m going camping at the end of this month with my two toddler boys..Not only is this recipe fantastic but I love your toddler tips are ones I would have never thought of! Thank you so much! if taking them camping, after wrapping in foil & freezing…how do you keep them frozen? or do you just keep them cool in your cooler until ready to heat & eat?? i’m new to this whole cooking when we camp thing & am exicted to try new things…we usually just take boring sandwiches, etc lol. thanks. so glad that i saw this on pinterest! my fella loves breakfast burritos. it would be great to make some and freeze them for him to fix. how long do you think they would stay good in the freezer? 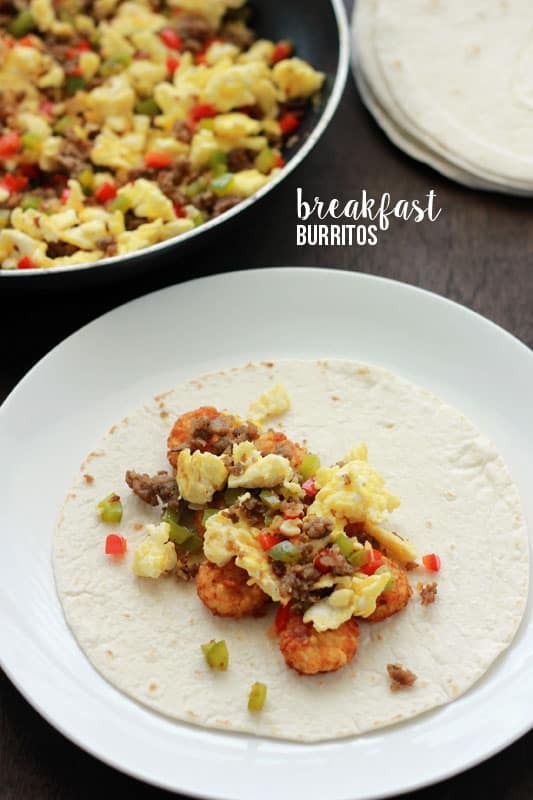 I totally make 20 – 40 breakfast burriteos every 2- 3 months for my hubby. It takes a couple hrs to assemble them all, but breakfast burriteos freeze wonderfully. And what you said about optional ingrediants is totally true. I often make a couple different types and always do a couple with pepperjack cheese for a bit of kick. My hubby works nights so having him be able to grab something out of the freezer at 6 or 7am that is not thru a drive through is a huge plus. I can sit with my coffee and don’t have to move unless i want to! LOL I haven’t tried the sour cream in the eggs – definately will be on my list for next time. Great idea! I tend to sub greeky yogurt for sour cream in recipes – do you think that would work here too? Will totally take them camping next time too – very cool idea! Thanks!! How did the Greek yogurt work out? I just made these for our camping trip tomorrow and I only got 17 burritos….what happened? ?,,,..I even used 21 eggs and used 1 lb sausage and a couple pounds of steak (for my hubby) and split the hash browns and eggs in half between the two….. I thought I would get a little more than the 24 since I used more meat and stuff….. How big are the tortillas you used? Also the bag of hash browns? Just curious for the next time I make them 🙂 we are excited to eat them! I’m sorry!! I should have included the tortilla size in the post! We don’t use the burrito tortillas… I will have to look the next time I buy them… They aren’t the small ones, but the ones in between! I’ll make the recipe again today, and make sure it comes out to 24! hi! i’m wondering how long it would take these to thaw in a cooler. we’re leaving in the morning and it will take us prob 6 hours to arrive – would they be thawed enough by the next morning to heat without taking forever? I’m not exactly sure how long it will take them to thaw, but ours were frozen solid and only took about five minutes to heat up when we were ready. I’m sure if you got up and pulled them out of the freezer about an hour before you wanted to start breakfast you’ll be good to go. I am wanting to make more of a Mexican/ground beef version for a campsite dinner. Would you just follow the same process? Yep. Just use the same process, but change the ingredients to fit your theme. I made these for a camping trip….it was the hit of the weekend! Thank you SO much. We actually took the foil off at the last minute and toasted the tortillas a little. Delish!! Debbie, I’m so glad they worked out for you!! They are always a family favorite when we do large get together’s! Do the torillas get soggy from the moisture in the eggs? I made these and love them! Found you on Pinterest! Thanks so much for a great recipe. Just curious if you have any idea about the calorie count of each one? I wish I did. Everyone has asked. I’ll look into it and see what I can’t come up with. Just found this link and site. Cannot tell you how grateful I am ! We are going for 4 days on a camping trip and I am not a camper cook so I’ve been at a loss for easy portable meals. Your ideas are fantastic and the breakfast items are so easy to make and keep. I’ll be making them at home as well.! Thank you, thank you!! I’m glad this helped you out! Good luck on your camping trip! Made these for a camping trip last weekend. Fed 11 hungry people for TWO breakfasts. They were a hit! Only thing I added was a can of green chilies to the eggs. Worth the time in the kitchen to relax while “cooking” breakfast for a large group. YUM, can’t wait to make these again! HI! I was just wondering if you know if anyone has ever tried reheating these in a electric roaster? I would freeze them just to be safe. Hi there! I just love these recipes but I have 5 year old twins and I am lucky if they will eat anything other than uncrustables and chicken nuggets. What foods have worked best for your little one? Thanks so much! I only need about 6- 10 burritos. Do you think I could half the recipe and they would still turn out the same? of course! It’s very forgiving. You can substitute and add anything you’d like. The bag is wrong for our microwave. I wrote that on there but after some experimenting found that the time was a little too long. Fabuloso! Made these for a camping trip, but they were gone before we even left! I guess I will make another batch; not so bad because they are super easy to make! Thanks for the recipe! We love them! Where can I learn how to fold up the tortilla? Looking forward to making them. If you google search or look on youtube there are a few video tutorials. We really enjoyed these! I heated the defrosted burritos on a cheap little panini press we take with us; toasty grill marks! Just curious, what size bag of potatoes? thanks! Going to make these soon for a trip this weekend! Did you use large size tortillas, or small size? My family LOVES these burritos. We have to have them every time we go camping. I’m about to make another batch for the weekend. Thank you for a wonderful and easy recipe! We have a huge camping group (45 people, some of which are teenage boys). I plan to make a ton of these. We will have electrical outlets so I hope to heat them in large roasters. Has anyone done that? Any guesses on roasting times if I have the roasters full of burritos? Thanks!